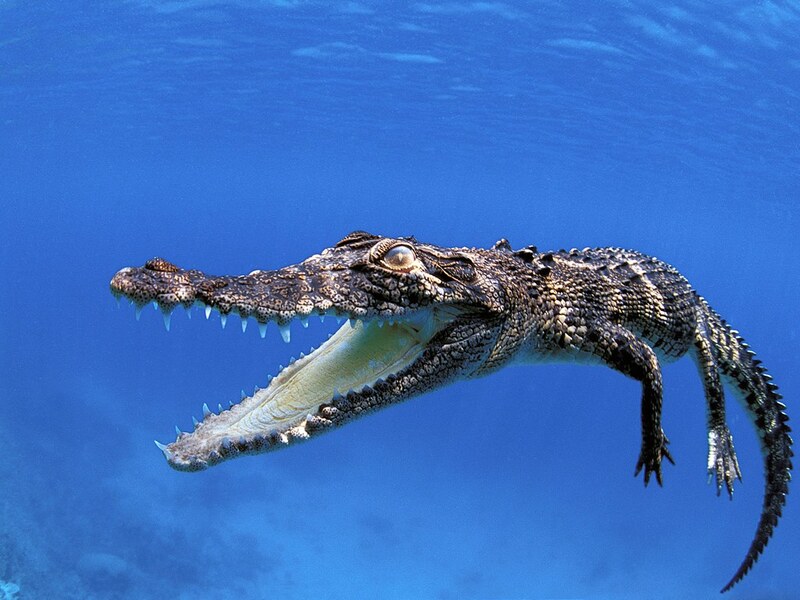 The saltwater crocodile is the largest of all living reptiles, as well as the largest riparian predator in the world. Males of this species can reach sizes up to 20.7 ft and possibly up to 23.0 ft in length. However, females are much smaller and often do not surpass 3 m (9.8 ft). As its name implies, this species of crocodile can live in marine environments, but usually resides in saline and brackish mangrove swamps, estuaries, deltas, lagoons, and lower stretches of rivers. They have the broadest distribution of any modern crocodile, ranging from the eastern coast of India throughout most of Southeast Asia and northern Australia. The saltwater crocodile is a large and opportunistic hypercarnivorous apex predator. Most prey are ambushed and then drowned or swallowed whole. It is capable of prevailing over almost any animal that enters its territory, including other apex predators such as sharks, varieties of freshwater and marine fish including pelagic species, invertebrates such as crustaceans, various reptiles, birds and mammals, including humans. Due to their size, aggression and distribution, saltwater crocodiles are regarded as the most dangerous extant crocodilian to humans, alongside the Nile crocodile.